Whether it is a passenger, cargo shipping or merchant navy ship, all of them require efficiently working exhaust gas cleaning system to remove sulphur oxide from the gases released by ship’s engine and boiler sections. According to latest regulations ship owners can choose from two options, either they apply expensive cleaner fuel to prevent sulphur oxide’s release in the atmosphere or they can install onboard marine exhaust solutions to prevent release SO2. Most of the ship owners have found installation of gas cleaning system a better choice than using costly fuel for the cleaning procedure. 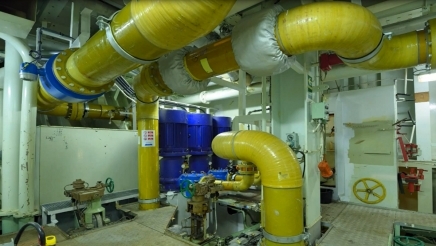 Before you move to read the details regarding how our solution offers the best marine exhaust system cleaning, you must know the impact of excessive sulphur dioxide release in the ship or atmosphere. It is quite a harmful gas that can cause severe problems to human health. The passengers or staff in your ship may face chest pain and they can also find it difficult to breath. Experts of IMO know that and that’s why they have set regulations for all sorts’ ships. Our exhaust gas treatment system is capable of preventing release of SO2 in the atmosphere and ship. According to new IMO regulations, a ship can release 0.1% sulphur in ECA and all-inclusive limit is only 0.5%. It would be quite tough for you to follow the regulations, if you allow a newbie to develop the gas scrubber system for your ship. We are experienced in development of tailor-made scrubber systems and we have served many of our clients in reducing sulphur emission. We present you complete plan about how the development and installation process will take place for cleaning exhaust pipes. Everything will be done in a professional way so that your ship can wade without breaking any rule of IMO. Different companies provide different solutions for exhaust gas cleaning and the main aim is to reduce sulphur content in released gases according to current guidelines of IMO. We develop system that includes three main sections, a vessel that facilitates mixing of water into the released gases of engine and boiler sections. The water can be salt-water from sea or fresh water from ship’s water container. Another section is used for filtration of sulphur and other pollutants from exhausted gases. The sludge removing procedure completes in the last section for which water is used. That’s how we develop and install the mechanism to clean exhaust gas system. The plans can be customized according to requirement of the client. We are developing and installing important sections of the ship like ballast water treatment system, marine HVAC system and exhaust gas scrubbers for ships for a long time. We are experienced and know each regulation of IMO and USCG very well. Our cleaning exhaust system meets all the guidelines and it also requires low maintenance in future. You get maximum exhaust cleaning and that’s what helps you in running your business successfully.